Hello, happy Easter (or long weekend) and welcome to episode 9 of The Low Carb Universe Show! …and also hear Hanna’s beautiful (?) birthday wishes to Bitte! No links in this one, but why don’t you check out LCU18 or the world’s leading expert on sugar addiction Bitten Johnsson? We hope we haven’t destroyed Easter completely for you. We wish you a wonderful Easter weekend and eat real food! 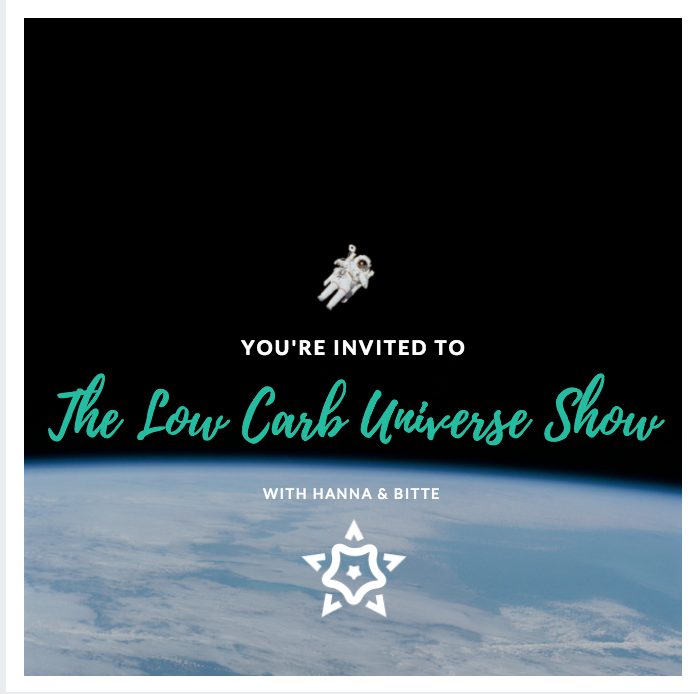 Hello and welcome to this weeks episode of The Low Carb Universe Show! Today, Bitte has a very special guest, Pia Holmstedt-Englund! Pia was one of our fantastic speakers at KetoLadies, and taught us about breathing correctly and showed us how to do MediYoga. Why low carb isn’t difficult – a beginners guide! KetoLadies: what did Pia think? What were her experiences as an “outsider” of the low carb world? …and how did Pia get so good looking?! You’ll hear it all in today’s fun podcast episode! The Low Carb Universe – LCU18 coming up in November! Wow, what a whirlwind KetoLadies has been! Today, you get the behind the stage talks. Do you suffer from Post-KetoLadies Syndrome? We do, and we discuss it all, the feelings, the food, the speakers, the guests… As well as the dancing, the future, the fun and the tears. Listen in, it’s definitely worth 22 minutes of your time. Especially if you weren’t able to join us.